Did you know that MITRE hosted 75 interns at 20 of our sites across the country? This is in addition to the more than 350 interns at MITRE's corporate headquarters in McLean, Virginia, and in Bedford, Massachusetts. All of our internships focus on providing students valuable work experience and further expanding interest and learning in the science, technology, engineering, and math (STEM) fields. Similar to full-time site employees, interns working at MITRE sites were frequently co-located with sponsors. As a result, many of the interns had the opportunity to work closely with our sponsors and often saw the direct and immediate impact of their work. This proximity also provides the interns with a close look at the day-to-day interactions and the trusted adviser role MITRE has with our sponsors. As is the case with interns at MITRE's main campus, interns working at our sites had a wide variety of academic backgrounds both at an undergraduate and a graduate level. And they supported MITRE's work in areas such as cybersecurity, healthcare, networking and communications, systems engineering, information technology, big data, and technological and capabilities research. 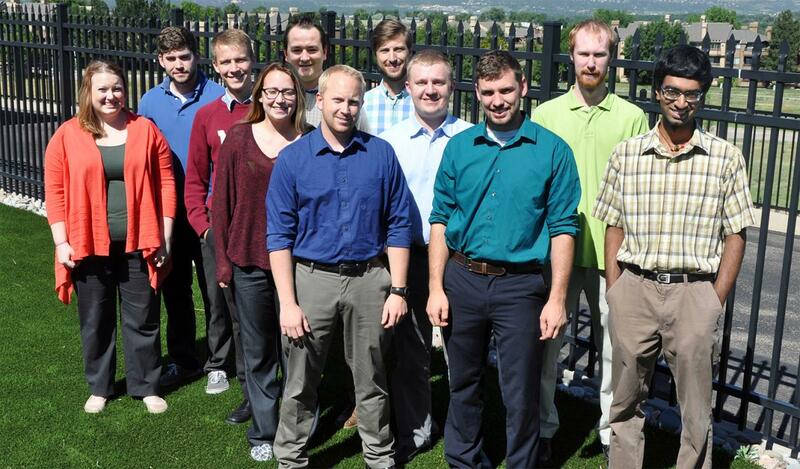 "Two of our interns last summer worked on Air Force Academy projects," says Kelly Gerschefske in Colorado Springs. "One researched ways to enhance the cadet system and another focused on healthcare and data performance. On occasion we've also had interns—who already have the appropriate DoD clearance—working on classified projects." Justin Brunelle reported that one intern at MITRE's Hampton Roads, Virginia, site worked on programming Internet of Things (IoT) sensors for mock battle labs. Another intern at the site designed an experiment to measure data growth rates in a cloud-based data ingest framework. MITRE's Rome, New York, site had three interns supporting multiple cybersecurity and Air Force projects. For example, one intern researched ways to automatically create and export data from a data repository to roadmaps. Another investigated the data and available tools used by cyber networks for situational awareness and built a widget to display this cyber data. In Huntsville, Alabama, all the interns' work supported MITRE's Missile Defense Agency work program. "Our interns took on a number of projects," says Department Head Kim Shepard. "They developed a tool to determine optimal locations for new missile interceptor terminal stations. They also took on developing a toolbox to facilitate missile planning and designed a cyber threat test to help identify potential weaknesses in missile communication subsystems." At the Shaw Air Force Base site in South Carolina, a former co-op student came back to MITRE for the summer and continued her work on a GPS jamming tool she developed the previous fall. At the request of the sponsor, she and another intern continued the work and integrated it into the Joint Mission Planning System. In Chantilly, Virginia, two interns supported the Persistent Entity Processing prototype. The prototype attempts to continuously find specific programming entities (that live on in a system's memory even after shutdown) using multiple algorithms and to evaluate hypotheses about topics of interest. The interns wrote code in Python, MongoDB, Apache Kafka, Spark, and Django to build out a new version of the prototype. "We had five interns working on a variety of initiatives in healthcare policy and analysis," says Nicole Sweeney from the Baltimore site. For example, in one project they provided a showcase of an enterprise-level systems model that could provide structured requirements to the technical enterprise especially around modularity and reuse for Medicaid. They also modeled the effects of alternate payment models for providers and conducted policy research into tools and resources available to Medicare and Medicaid beneficiaries. At MITRE's Los Angeles site, where much of the work supports the Space and Missile Systems Center, three interns conducted a software tool analysis where they evaluated utility and compare/contrast tools. They also supported research in the next-generation GPS and contributed to the three main modules of a software Space Vehicle Payload Simulation. While these were only a few examples of internships at MITRE sites, one thing remains the same: MITRE's commitment to providing STEM learning opportunities to today's students, regardless of where they are located. Planning is underway for next year's internships. If you are interested in becoming a MITRE intern, check out our current Job Openings or read more about our Student Programs.